While we are busy trying to make the best use of time, we always want our worlds a certain way. Sometimes you want to dream, go back to your past or delve into the future to see the unknown. So last weekend we gave our bloggers our creative writing prompt 'If I Had A Time Machine', a tool to efficiently travel in time. We asked them to tell us about their world, their life and adventures had they been flown into a different time with the help of a time machine. Here are the secrets, fantasies and dreams that unfolded last weekend. 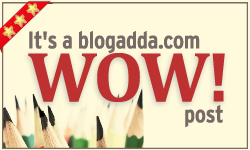 Thanks Blogadda! May this be a beginning of a blogging connection. Will flaunt this badge with pride.